"Cleaning windows was always time consuming and hard work. Now with The Ultimate Cloth the job is easy and fun. Windows are streak free. Valerie introduces the . . .
No more expensive cleaning chemicals! 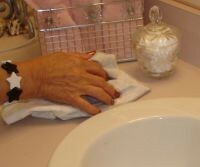 No more allergic reactions or hands rough from cleaners! 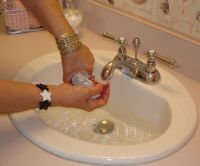 No more paper towels ending up in landfills! Think of all the money and time you'll save! The Ultimate Cloth leaves windows and mirrors streak free! You'll be amazed how easy cleaning windows can be! Please be advised that you will fall in love with the Ultimate Cloth and become addicted to it. "I never thought I'd say that I love cleaning windows! The Ultimate Cloth gives me back hours that I would have been spent cleaning because it cleans so thoroughly and quickly," remarked Valerie. Surfaces that are clean do not attract dirt or grime quickly, so you clean less often. 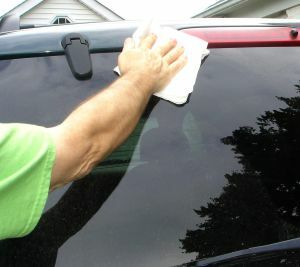 Keep your car windows clean too. No need for expensive car cleaners, just use the Ultimate Cloth and water! You'll be amazed at the cleaning power of the Ultimate Cloth. The secret to streak free cleaning is to rinse the cloth often, wring it out tight, wipe the surface clean, rinse again to keep the cloth clean. Re-usable for years!